I got an award. Three times, actually! Thanks Eileen, Melba and Lisa. I can’t even express how good it makes me feel today! It is funny because Eileen is probably my newest bloggy friend, while Melba is my oldest bloggy friend (she was the first to comment my blog!) and Lisa came in somewhere in the middle. Thanks girls! 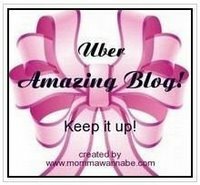 About this award…The “uber” (synonym for super) is a blog award given to sites who:- inspire you- make you smile and laugh- or maybe give you amazing information- a great read- has an amazing design- and any other reason you can think of that makes them uber amazing! 1) Put the logo on your blog or post. 2) Nominate at least five blogs (can be more)that for you are uber amazing. 3) Let them know that they have received this uber amazing award by commenting on their blog. 4) Share the love by linking to this post and the person you received the award from. Nity – Nity is currenty in the process of her first FET. She is so strong and positive throughout this whole process and her posts very frequently make me laugh! Angie – Angie and Aaron just got matched with a bmom and I am not jealous at all (ya, right!). They going through some crazy exciting times right now! Sarah – Sarah is one of my very favorite people in bloggyland. She is always supportive and wonderful, and she is so open and hilarious! Tracey – I love tracey’s blog because there are ALWAYS new posts to read and she is always so uplifting and positive. Debbie B – Debbie is always sharing stories and info. She is like my own personal vat of adoption information! And I love watching her little darling grow! Thanks for the award! I am blessed!!! Stop over to my blog and enter the great contest I’m having! You only have until Friday to choose your day!